Why Buy Wholesale Ice Cream? While most households don’t need an industrial sized tub of thirty of their favorite flavors, buying wholesale ice cream can have unexpected benefits at the office, in your restaurants, and in a number of other places. Not only will buying wholesale ice cream save you money but it ensures your favorite thing is always at your fingertips. Unsure if you should purchase wholesale ice cream? Keep reading and allow our unexpected reasons to convince you this is the best idea you’ve ever had. While this may not seem like a reason to buy wholesale ice cream, we promise it is. Everyone loves ice cream, so always having ice cream makes everyone happy. Happier people do better quality work and live better lives. Therefore, everyone should eat more ice cream. The worst feeling is opening the carton only to find there isn’t a single scoop left. Thankfully, this can be avoided. Buying wholesale ice cream ensures you consistently have enough ice cream to go around. More ice cream equals happier people and happier people equals better productivity. Whether you’re trying to keep your office motivated during the summer or appeasing children at daycare, ice cream will always improve the mood. Properly stored in a temperature controlled freezer, it can last upwards of two months. This means you don’t really need to worry about it going bad. You can buy it in bulk without worrying if you’ll finish it in time. 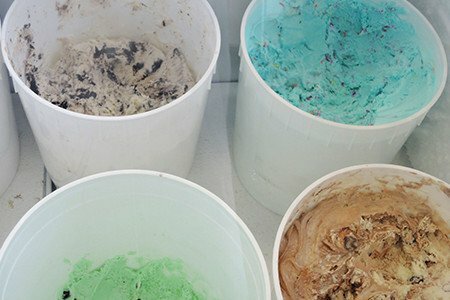 In two months, no matter how big the order was, your stash of wholesale ice cream will be depleted. While this isn’t really unexpected, it’s persuasive enough that it needs to be mentioned. Buying anything wholesale will save you money. You won’t need to pay for an abundance of packaging and most sellers will give you a deal because you’re buying so much. You won’t need to worry about finding your favorite flavor when you buy wholesale ice cream. From classics like chocolate and vanilla to exciting flavors like cookies & cream and mint chip, you’ll find an abundance of gourmet flavors available for sale. Supermarkets aren’t the only entities that can purchase wholesale ice cream. Hotels, restaurants, and even offices can benefit from buying in bulk. While hotels and restaurants might use the additional savings to turn profit, offices can use wholesale ice cream to improve the general mood and company culture. Sponsor an ice cream social in the office to encourage interaction between co workers and make your office a fun place to work. Interested in Buying Wholesale Ice Cream? We pride ourselves on creating truly premium ice cream in a variety of gourmet flavors. Made with little added air and real California milk, our ice cream is known for being incredibly creamy. If you’re looking for wholesale ice cream, try ours and you won’t be disappointed. In fact, you’ll probably double your order.